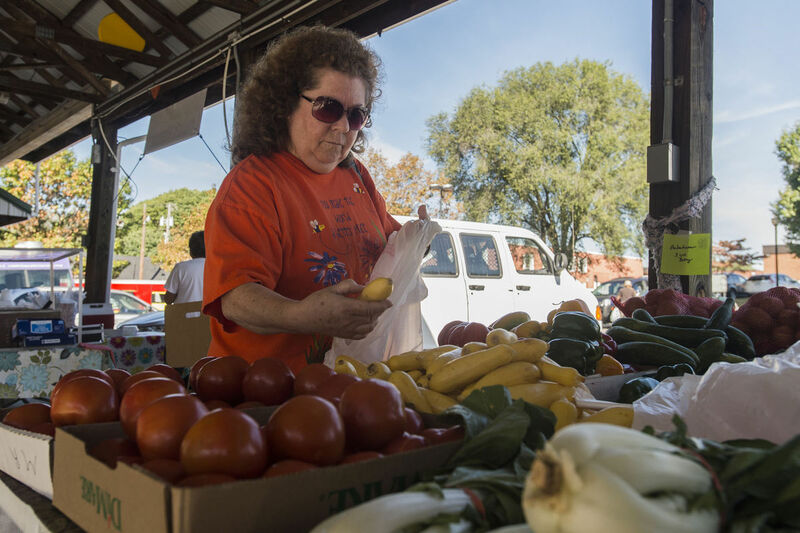 BEDFORD —Lisa Wright, who lives in Rain Tree Village, took a free bus Friday morning from John Early Apartments next door to buy groceries from Walmart and the Bedford Farmers Market. Wright bought cabbage and green and red bell peppers at the farmers market. 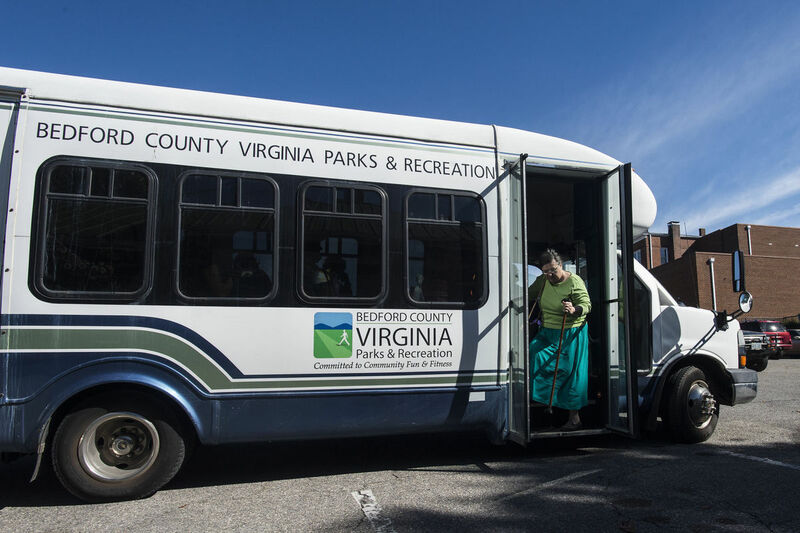 The Bedford County Parks and Recreation bus, which can hold 18 riders, began providing residents of subsidized housing complexes near Blue Ridge Avenue free rides to Walmart in the town of Bedford in May, Denny Huff, executive director of Bedford Community Health Foundation, said. The bus program was created with the help of the Bedford Area Resource Council, which is comprised of nonprofit organizations and others that meet monthlyto address poverty issues in the community, Huff said. The subsidized housing complexes that are served include Rain Tree Village; John Early Apartments, which serves seniors and disabled people; and Salem Court Apartments. The complexes are about 3.5 miles to 4 miles from Walmart. In June 2016, Centra Bedford Memorial Hospital conducted a survey that found that a lack of transportation was a barrier for people to access health care and other resources, Huff said. Armed with this information, the group created the pilot. The number of riders varies from about five to 11 for each of the two routesthat run on Fridays at 10 a.m. at John Early Apartmentsand 10:30 a.m. at Salem Court Apartments. Riders’ feedback is important, Huff said, especially about what works, including the time, day and location. “We’d love to add locations,” Huff said about picking up more riders. The Bedford County Board of Supervisors approved the use of the bus earlier this year and the Bedford Community Health Foundation is paying for the cost of gas and a bus driver, which so far has been about $2,000, Huff said. The foundation has been paying for the program from its funds as well as with a $65,000 grant received in 2016 from the Centra Foundation, Huff said, adding the grant also has been used to provide dental care and other services. Huff said for the first few months, a staff member from the Department of Social Services also rode the bus to get feedback, answer riders’ questions and tally the number of riders. Andy Crawford, director of the county’s social services department, said the service helps address the area’s lack of public transportation. In August, the program added a stop at the Bedford Farmers Market. The market offers tokens to customers who pay with SNAP, or Supplemental Nutrition Assistance Program, that double their purchases up to $25 per day. 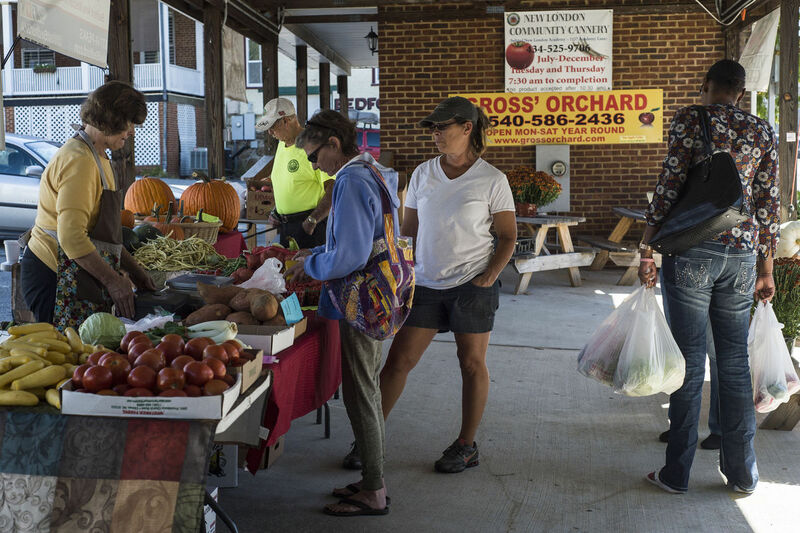 Last year, the farmers market received about $2,500 from SNAP customers, Jana Fedele, the farmers market manager hired by the Bedford Area Family YMCA, said. This year, it has received about $1,936. The market also began a program called Bonus Bucks in August, which gives$10 to SNAP recipients in the last week of the month if they bring a receipt showing they bought something from the market earlier in the month, Fedele said. John Early Apartments resident Peggie Palmer on Fridaybought squash from the farmers market and an omelet from the Centra food truck called Code Fresh parked at the market. “Where else can you get eggs and all the veggies for $2?” Palmer said. The foundation is committed to offering the bus through the winter, Huff said, adding it is considering charging a low monthly fee to ridersto help pay for the cost of the program. The bus could also go to Food Lion on U.S. 221 near Valleyview Drive, where there also is a CVS store, Huff said. Rain Tree Village resident Sandra Bonds said the bus is convenient for her and she would be willing to pay for the service. On Friday,She bought groceries at Walmart, including bananas and eggs, and picked up her prescription medicine. Gail Hultay, who lives in Salem Court Apartments, said she didn’t take the bus the first time it was offered, because she wasn’t sure it accommodated the walker she uses. When she found out it did, she got on board. The Bedford Farmer’s Market is located at 220 W. Washington Street in downtown Bedford. It is open 9 a.m. to 1 p.m. on Saturday, Oct. 7. It is also open from 7:30 a.m. to 1:30 p.m. on Fridays until Oct. 27. SNAP customers can double their dollars up to $25. 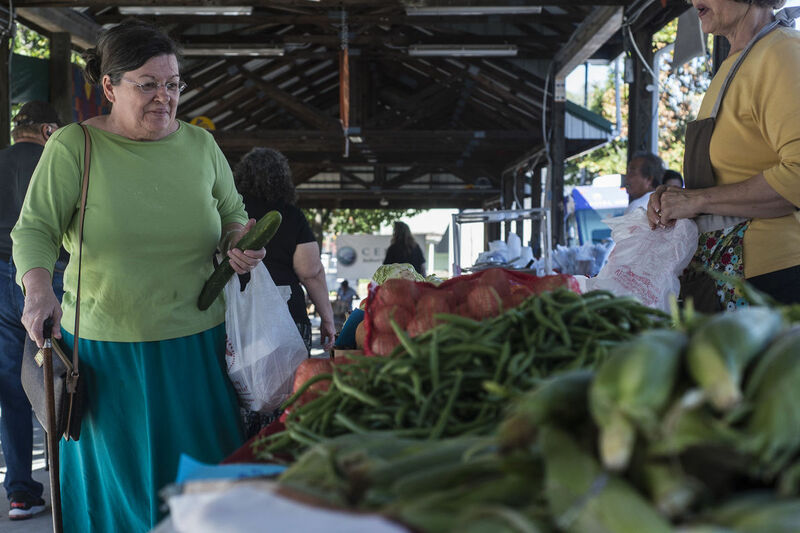 If SNAP customers bring a receipt from the first three weeks of the month of the farmers market, they can receive an additional $10 during the last week of the month.